Includes six scattering tubes, packed in one black gift box. Each tube includes its own black velvet pouch. 8.5" L., 1" Dia., 6 c. i. Large - 200 C.I. , 10" x 7.25"
200 c.I. 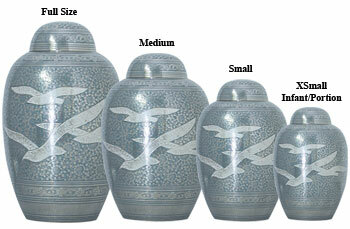 10.5 x 6.3 A beautiful hand-crafted urn 11.2" x 6.9", 200 c.i. Stock and Custom engraving available. 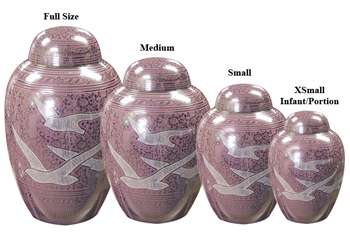 A beautiful hand-crafted urn. 11.9" x 7.6", 200 c.i. brass. Stock and Custom engraving available. Gold or Pewter, A beautiful hand-crafted urn. 11.9" x 7.6", 200 c.i. brass. Stock and Custom engraving available. A beautiful hand-crafted urn. 10.5" x 6", 200 c.i. The Ellora Series are brass core urns. They are hand finished with applied pewter or bronze and beautifully polished. 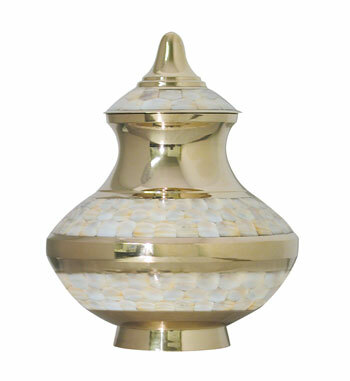 The Ellora Series are brass core urns. They are hand finished with applied pewter or bronze and beautifully polished. A classic brass urn with a unique glossy finish and matching lid accent. Each color features a metallic shimmer as well as a high gloss sheen. height: 3", width: 1.7"